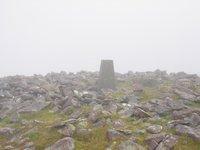 Bagged this trig in thick fog. Started out from Killelton and ascended via Gearhane and Caherconree to reach Baurtregaum returning via Scragg. Good visibility below 650 metres. UK design, spider, no cap no FB, vgc except for construction defect at bottom. Primary trig.